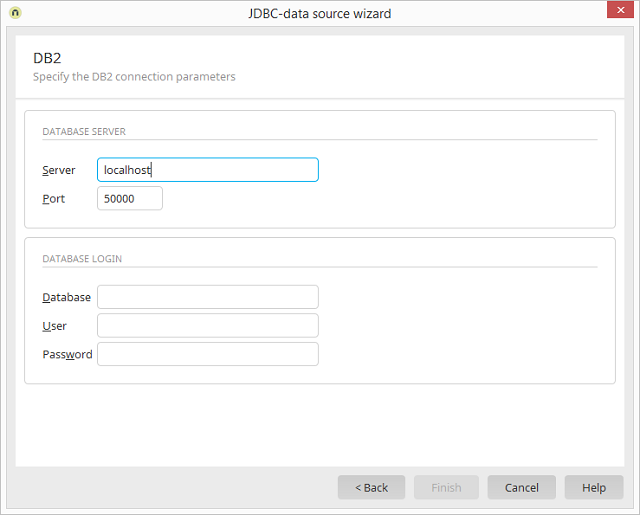 Integration module Create Data transfer General settings / Type of data source: JDBC Source - JDBC database / Click on Wizard IBM Select DB2 driver / Click on "Next"
Enter the name or IP-address of the computer here, on which the IBM DB2 database is installed. Here the communication port of the database has to be entered. In most cases you can keep the default settings. Enter the name of the IBM DB2 database.